Do you find yourself constantly moving products from one area of your facility to another? Are you fighting the friction of metal tabletops as you slide your products from one place to the next? Or worse, are your employees wasting valuable time transporting products by hand? If the answer to any of these questions is yes, you are in a great position to save time – and money – with Triton’s Chain Driven Live Roller Conveyors (CDLR). Ideal for moving tires, drums, pallets and other unwieldy items, Triton’s conveyors are world-renowned for their ruggedness, versatility and ease of use. 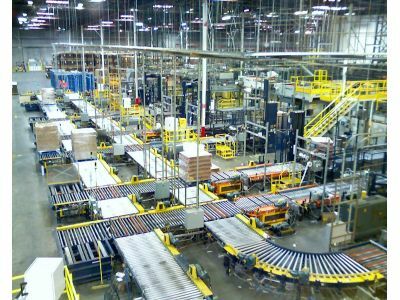 In this post, we’re going to look at how your operation can benefit from utilizing a Triton conveyor. With Triton’s curve conveyors capable of handling 30, 45, 60 and 90 degree turns, moving your products has never been more convenient! Additionally, a range of drive mounting options and roller configurations ensure that you can fine tune and adjust the speed and handling of your products. Featuring a welded construction, floor supports, side guides and end stops, Triton’s Chain Driven Live Roller Conveyors are built to last. In addition to this, a durable powder coat finish helps to preserve the equipment’s aesthetic as well as durability. Operating at 1750 RPM and featuring a max speed of 80 FPM, Triton’s conveyors are built to do what their name implies: convey. Moving products from one work area to another has never been faster, easier or more cost-efficient. At Technical Packaging Systems, we offer a diverse assortment of the industry’s most reliable packaging systems. Whether you’re looking for bagging systems, case formers, food grade conveyors, label applicators or any number of other packaging solutions, we’re confident that we can provide the equipment that you need to optimize your production line. If you’d like to learn more, be sure to view our product pages and, of course, if you have any questions don’t hesitate to contact us!